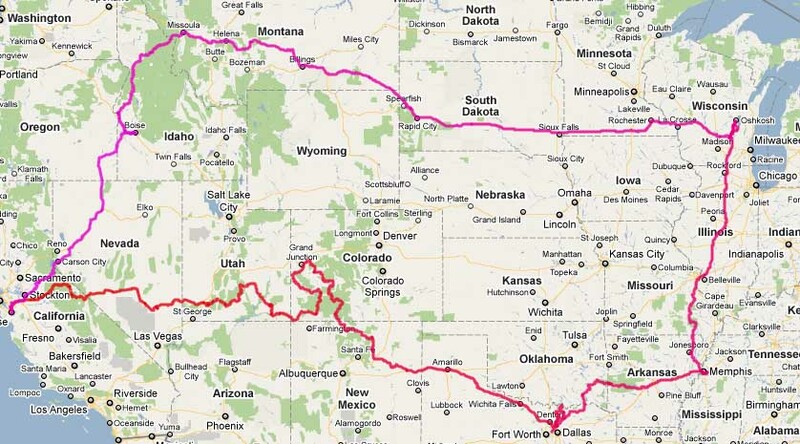 And so begins the tale of what turned into a 7K mile motorcycle adventure on my trusty 2008 BMW F800ST. The “final” destination is Oshkosh, WI to catch the big airshow that happens each year around the end of July. Some of you may be thinking this all sounds so familiar, but, with an extra week, 40% more miles, better roads, more solo time, more destinations, and … Let’s just say turned into a much different trip for me than the prior year’s adventure. For quick navigation, jump to day:1, 2, 3, 4, 5, 6 & 7, 8, 9 & 10, 11 & 12, 13, 14, 15, 22. The route — a little teaser of what’s to come …. Mid July is coming faster than I’d think it will. 6K miles of adventure are not going to get ready all by themselves. Got a quick ride in today — 112 miles. Quickly coming up on the 1K mile mark on the odometer. First time taking the new bike up highway 9. Must have had half a dozen riders signal to warn that the police were up ahead; this part of the ride was none too spirited. I’m starting to get the hang of pulling files of the gps and saving the tracks I want to a web page. Once I have the system nearly automated, I’ll share it here. While most of the masses were watching the Super Bowl, I took advantage of the empty roads and put a 115 miles or so on the cycle. While the miles weren’t huge, it was 3+ hours in the saddle and I wasn’t uncomfortable at the end and could have easily kept on going. Doesn’t sound like much, but, that 10-day Oshkosh trip in July isn’t going give me the luxury of stopping every hour. Click on the map to go interactive.